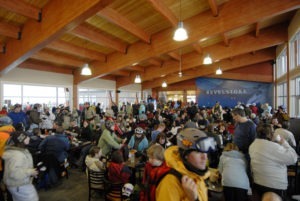 There is a newly-renovated and expanded post-and-beam Revelstoke Mountain Resort Day Lodge. It’s the natural heart of a major recreational development in beautiful British Columbia. But few visitors to the lodge, with its 215-seat restaurant, espresso bar, and meeting areas, will ever know its secret. The natural-looking ceiling they congregate beneath disguises a state-of-the-art Insulspan® Structural Insulated Panel (SIP) System. And, it’s a system known for its structural strength and energy efficiency. The Insulspan SIP roof panels are quietly and effectively at work every day. Each Insulspan SIP consists of a core of moulded expanded polystyrene (EPS) insulation with engineered oriented strand board (OSB) laminated to the top and bottom faces. SIPs are a natural choice of Cornerstone Building Solutions, the company responsible for the Revelstoke Day Lodge transformation. But, why are SIPs a natural choice? It’s because the high effective R-Value and reduced air leakage provided by the Insulspan SIP System cuts cooling and heating costs. In fact, the dramatic cut in costs generated one of the construction industry’s highest energy efficiency ratings. Few visitors to the lodge will ever know its secret, a state-of-the-art Insulspan® Structural Insulated Panel (SIP) System. Additionally, a renewable resource comprises OSB. This means the Insulspan SIPs used on this project put a literal environmentally friendly lid on the lodge’s stunning floor-to-ceiling views of the Columbia Valley. Stevenson credits the Revelstoke Mountain Resort project with helping Insulspan secure another contract. This one for the 2010 Olympic Winter Games at Cypress Mountain in West Vancouver. “The product impresses,” he said.